A leading industrial distribution company in North America with more than 80 years of experience. The client wanted to shape a digital shopping experience to nurture customer loyalty and increase average order values by shaping a seamless and intuitive customer experience. 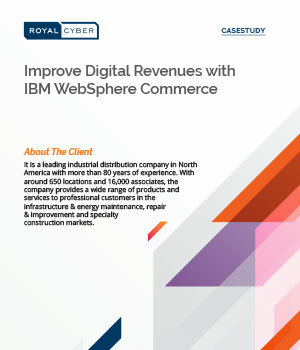 Royal Cyber implemented IBM WebSphere Commerce platform to provide an easy-to-use navigation and search functionality, seamless catalog management and Business-rules driven marketing campaigns for customers, based on deep insight into individual order histories and preferences.